This week marks the halfway point in my 52 Ancestors Challenge and the theme is appropriately halfway. A suggested twist on the theme was to discuss an ancestor who you feel you have only halfway researched. 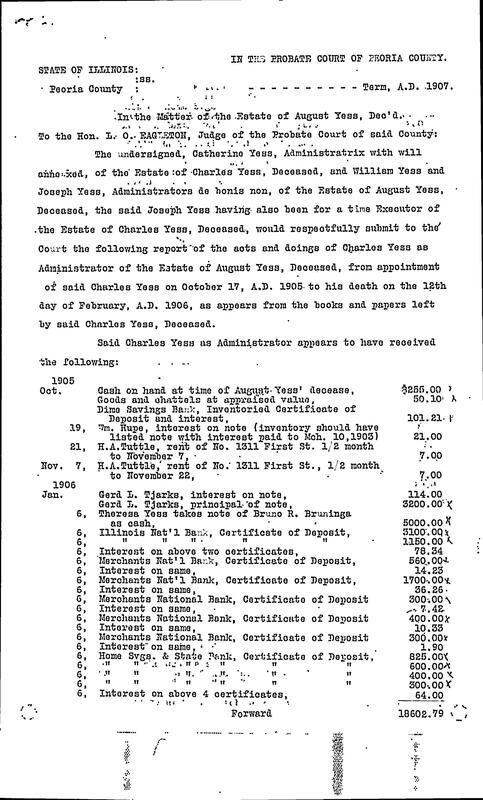 With much thought, I decided to further discuss my 2nd great grandfather, August Yess. 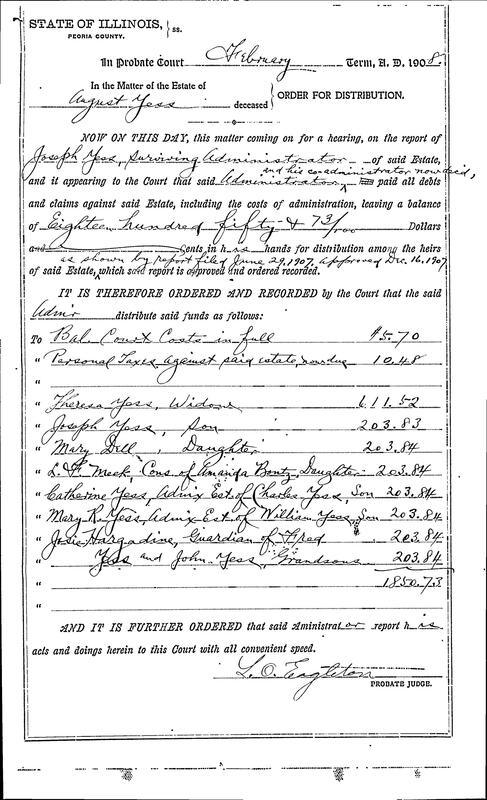 Here’s what I do know: August Yess, as he was known in Peoria, IL, was born 29 January 1829 in Baden-Wurttemberg, Germany. We believe he immigrated to America via Baltimore, Maryland in 1852. 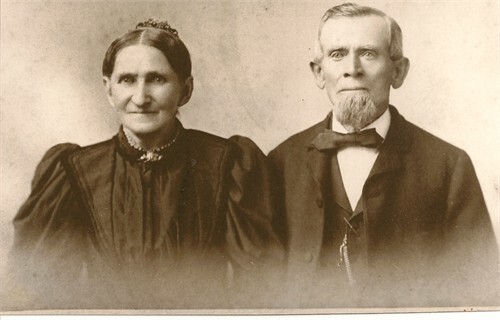 In 1855, he married Teresa A. Hanlach, also originally from Baden-Wurttemberg, Germany. They had six children: Charles, Mary, William, Amanda, Joseph and John. August died in 1905 and Teresa died in 1910. I feel I only know half his story because Yess cannot be his true surname. Yess is not a German surname. Much like many Germans who immigrated to the United States, the spelling of their surname was changed. 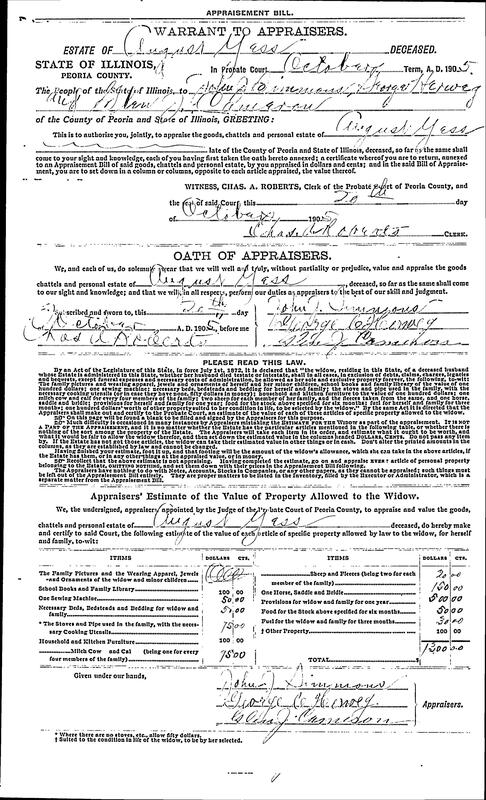 Naturalization papers from 29 October 1892, show August Gess becoming a naturalized citizen of the United States. He would have been 63 years old at the time and had lived in the U.S. for a length of 40 years. Why did he suddenly feel the need to become a naturalized citizen after 40 years? August was only 23 years old when he came to America. I don’t know why he immigrated here, but I have learned a lot about Germany at the time from an Latter Day Saints genealogist who specializes in Germany. King William and Baden were in upheaval during the 1850’s and he subsequently lost power to his son, Charles. The political upheaval led to military action which led to emigration of many Germans. Economic pressure also caused many Germans to emigrate to the United States. Was it military servitude or no money that caused August to leave? I don’t know anything about his family. 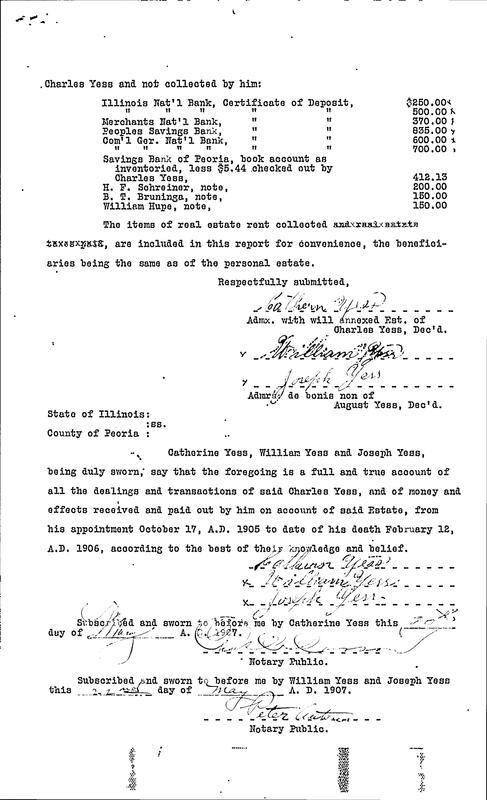 I haven’t successfully found records indicating who his parents were, how many siblings he had, where exactly was his home? Funny how these pieces to the puzzle tell so much about an individual. Without these important components, one can only speculate on motive. I don’t know if he came to the United States with any funds at all. Records did indicate he worked as a teamster for a time in Peoria County, Illinois after he immigrated. 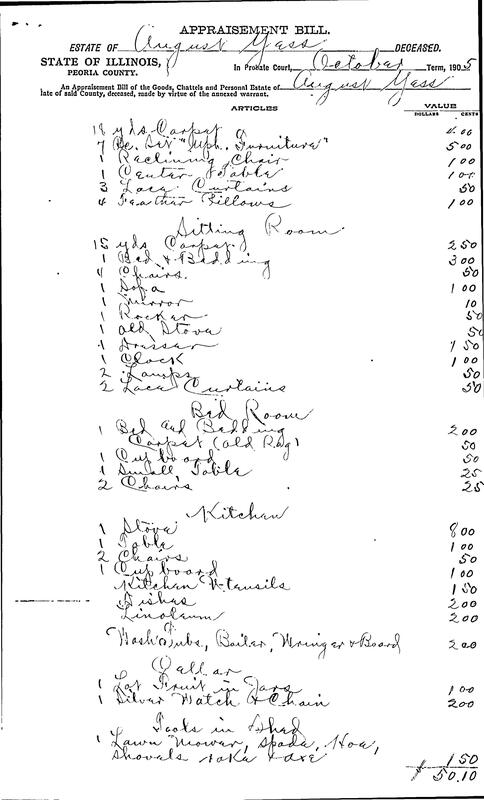 He also owned quite a bit of farmland in Jubilee Township of Peoria County, Illinois near the Princeville area. The Yess family still lives on Yess Road near Princeville. I do know upon his death, August had amassed quite a bit of money and land. 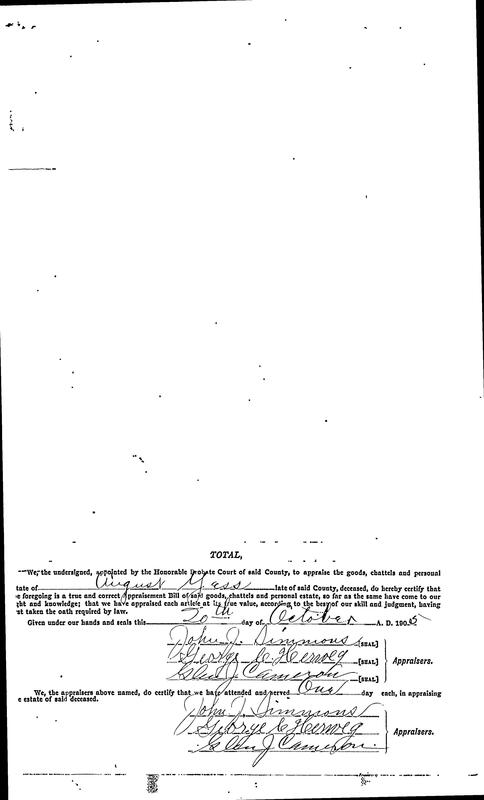 Peoria County, Illinois probate records indicate he had 15 different Certificates of Deposits in five different banks; three different personal loans he held from individuals, and rent due from a piece of real estate identified as “No. 1311 First Street” – town unknown, another listed as “H.A. Tuttle house” and “Lynch house” and various farms. In total, August Yess or Gess of Baden-Wurttemberg, Germany was worth $19,983 in 1905 which would be worth nearly $540,000 in 2015. 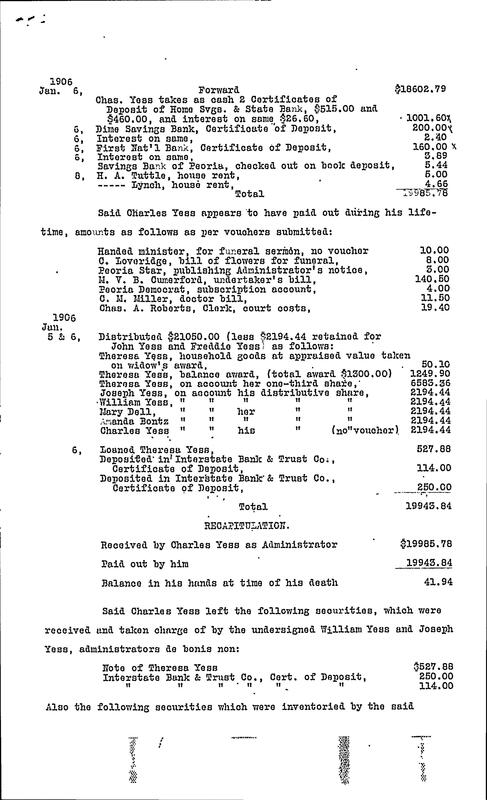 How did he purchase so much land, so many city lots and collect so much money? It’s going to require more research. Below are a just a very few of the probate records I have for August Yess. Halfway through the year with 52 Ancestors Challenge and I am compiling a list titled “I Want To Know”. #1 on this list will start with August Yess/Gess family history. In order to learn some of this information, I’ve decided to take the next step and study German at my university this fall. I don’t expect to become a phenom at it or a native speaker, but I do hope to be able to understand some of the basic documents I attempt to read. I’m hoping if I meet August halfway by learning German, he will disclose more information as a thanks. Knowing only half his story is like viewing a two dimensional photograph and attempting to see a three dimensional person. There are too many missing details. It’s time to fill in the details.